For who comes with car, bus or train from Venice Piazzale Roma and from railway Station “Santa Lucia” the best way is takes line 3 or 4.2 which reach the island very fast. It’s best to get off at Murano Museo stop and continue walking for 5 minutes, or to get off at Murano Colonna and continue walking for 15 minutes. 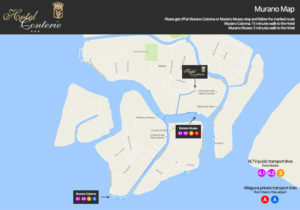 For who comes with the plane at Venice Marco Polo airport, take Red or Blue Alilaguna line that come direct to Murano Museo or Murano Colonna stop. In both cases the best stop to reach HOTEL CONTERIE is “Murano Museo”. As you can see HOTEL CONTERIE has a central location in the island very close the the “Glass Museum“, full of old glass manufactures, and the Basilica of SS Maria e Donato masterpiece of bizantine art.